The answer is YES, oils are toxic. So are watercolours and so are most ‘proper’ art materials. If they weren’t you could use them as food colouring! Kindergarten paints are non-toxic i.e. edible. In oils it is the pigments which are toxic as well as the mediums and cleaning solvents. Most pigments in all sorts of paint are toxic to a greater or lesser degree, which is why you should never lick your paintbrush. That white stuff – above – is mildly toxic – it is calcium carbonate – i.e. chalk. Oil paints consists of pigments suspended in oil and pigments vary. Some pigments are more expensive than others and that’s why ‘artist’s’ colours vary in price. The cost doesn’t reflect the lightfastness or the quality, just the ingredients. Student colours approximate the hue and are made using cheaper ingredients. e.g. Vermilion is made of mercury, and is highly toxic and very costly. However, we usually use Cadmium Red instead because it is lightfast, beautiful, cheaper and less toxic. Cadmium sulfide is not very toxic. In the student colours red is called Cadmium Red Hue which is less archival and won’t stay bright forever! Ochres and earth colours are generally not toxic. Flake White is the evil white which caused so many deaths in the 19thC because of its lead content. I use Titanium White and Transparent White which is Titanium based. Apparently titanium dioxide is used in toothpaste! Even though water-mixable oils sound completely safe, they aren’t really because toxicity depends on the pigments used. Some people are allergic to mediums. I have a friend who is highly allergic to latex and masking fluid, which is used in watercolours could be fatal. There are many mediums on the market, for thinning paint, thickening it or for special effects. To be absolutely non-toxic, thin with linseed oil even though it takes a long time to dry, and thicken with whitening (powdered chalk). You can speed up the drying process with something called Liquin by W&N or a similar product. You can thicken and speed drying at the same time with impasto paste. 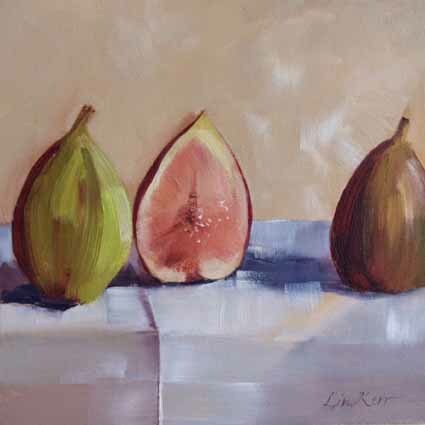 Three Figs 15-02 (sold on the silent auction) Painted with transparent earth red, sap green, Cadmium Lemon yellow, Alizarin Crimson, Ultramarine Blue and yellow ochre, Titanium White. You can check Wikipedia for toxicity of these colours. I teach and so I am as cautious as possible. Start with baby wipes to clean the palette and wipe the brushes and your hands. Rub your hands in baby oil to dissolve the oil paints and wipe them with kitchen towels. I wear gloves for cleaning brushes, but this is to keep my hands feeling nice. 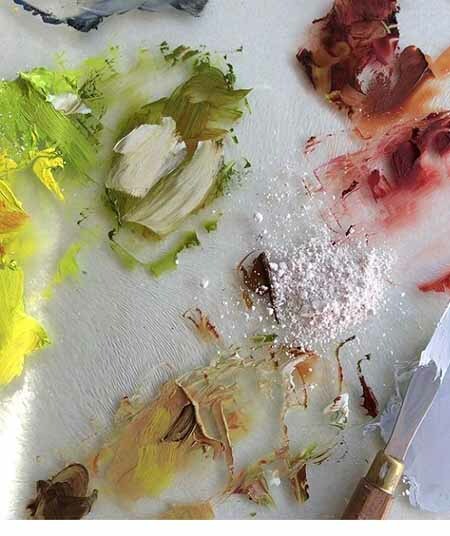 Decorator’s Turpentine: This is the ‘smell of an artist’s studio. My students don’t use it at my home and I only use it sparingly when they have left for a final brush clean-up. The fumes can permeate the entire house! Sansodor: This is a W&N solvent which has less of an odor than turps. Gamblin Gamsol (USA): This is an odorless solvent and it is comparably low in toxicity.